Empowering users while retaining full IT control, SonicWALL flexibly adjusts to the needs of your organization. For example, administrators could deploy end-user junk boxes (in one of 15 languages) or instead eliminate end-user junk boxes altogether. Or an administrator could allow some users to set their own spam blocking setting, while allowing another group of users to update their own allow/block lists or even generate their own reports. A junk box summary is a list of junk messages being stored for each user. 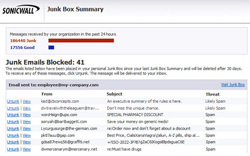 The administrator decides if and how often the junk box summary is delivered to each user. The default is once a day, but that can be changed. The administrator also determines what appears in the junk box - spam likely spam, phishing emails, etc. and can also block certain categories of from showing up such as pornographic or obscene spam. Personalized Spam Management means that for the first time the user, the administrator, and the organization all benefit from the same solution at the same time-without conflict. End users can feel in control of their inbox while administrators know they are in control of the system. Personal allowed and blocked lists. Individual allowed lists are automatically created and users can also add senders they wish to allow or block without IT intervention or interfering with corporate settings. Users can establish how aggressively to filter by category of mail and what languages they wish to filter. Users can take e-mails out of quarantine with one click. Users can determine the timing and frequency of the Junk Box Summary, the language they wish to view it in, and the types of quarantined e-mails they want to see. Users can delegate access to spam management. For example, administrators or executives can delegate access to an assistant, or employees can delegate access to a co-worker when on vacation.